You'll be £30.00 closer to your next £10.00 credit when you purchase Clydebank Battlecruisers. What's this? Order within the next 6 hours, 34 minutes to get your order processed the next working day! Between 1906 and 1920 the Clydebank shipyard of John Brown & Sons built five battlecruisers, each one bigger than the last, culminating in the mighty Hood, the largest warship of her day. If Tiger is regarded as a modification of the Lion class design, this represents every step in the evolution of these charismatic, and controversial, ships. Like most shipyards of the time, Clydebank employed professional photographers to record the whole process of construction, using large-plate cameras that produced pictures of stunning clarity and detail; but unlike most shipyard photography, Clydebank's collection has survived, although very few of the images have ever been published. For this book some two hundred of the most telling of these were carefully selected, and scanned to the highest standards, depicting in unprecedented detail every aspect of the building and fitting out of Inflexible, Australia, Tiger, Repulse and Hood. Probably more has been written about battlecruisers than any other warship type, and as modelmaking subjects they have a devoted following, so any new book has to make a real contribution. This pictorial collection, with its lengthy and informative captions, and an authoritative introduction by Ian Johnston, offers ship modellers and enthusiasts a wealth of visual information simply unobtainable elsewhere. It is a shame that more photographic archives of this nature have not survived, but we can take heart that this one has and that Ian Johnston has done such a laudatory job in bringing them to light in a manner that allows for frequent and easy reference. If you are a serious student of this subject and era, this landmark book and its by now several companions are indispensable. Military technology changes very rapidly and particularly as it applies to warships. The first battlecruiser built by John Brown & Co was trialled in November 1908. The last of these magnificent ships ‘HMS Hood” trialled in March 1920. She was more than double the size of her original sister shop ‘Inflexible’. Sadly, technology passed them by and two decades later they were largely outclassed. ‘Hood’ and ‘Repulse’, in particular, met tragic but quite different fates. This book, though, does them proud. Brilliantly illustrated and with a very detailed text, it describes their conception, design, construction and trials. Ian Johnston presents 218 of these fascinating images from the archive as a visual feast for the reader, first providing a brief history of the Clydebank yard. Together with an informative appendix covering facts and figures (and profile drawings of each ship) there is much to read. It’s the high quality photographs though, that are the book’s tour de force. This book contains a remarkable collection of photographs taken by photographers working for John Brown & Sons, one of the main British builders of warships at the start of the Twentieth Century. This is a superb book combining some useful text on the ships and their construction with an amazing collection of pictures. Although this is essentially a picture book, it is a cut above most illustrated volumes because of the very high standard of images reproduced and the story they tell of shipbuilding in the early 20th century. While this new publication is essentially a ‘picture book’, using rare and largely unpublished photographs from the John Brown archive, it is also much more than that, recording in detail not only the construction of the ships concerned. …overall content and otherwise excellent production values of the book. 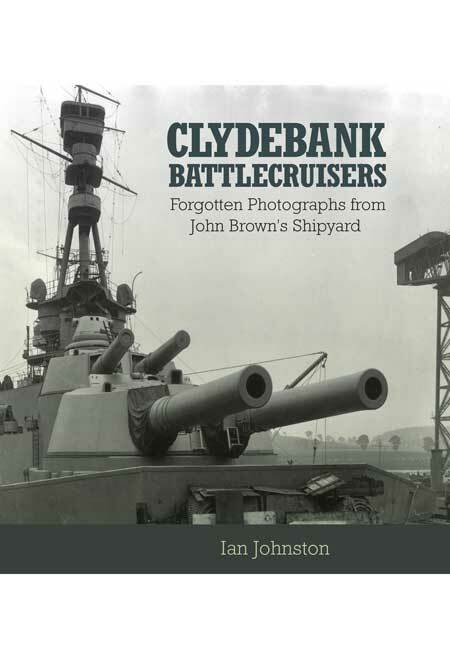 Clydebank Battlecruisers has to be on of the outstanding publications of the year, and anyone with an interest in the major ships of the grand Fleet or shipbuilding on the Clyde will want to own it. “This fascinating book delivers exactly what it says on the cover. Splendidly illustrated with contemporary photographs, many never published before. IAN JOHNSTON was brought up in a shipbuilding family, although his own career was in graphic design. A lifetime’s interest in ships and shipbuilding has borne fruit in a number of publications, including Ships for a Nation, a history of John Brown’s, and Beardmore Built, the story of another great Clydeside yard.